ENTHUSIASTS from far and wide had to contend with appalling weather when they attended the Bodmin & Wenford Railway on September 22-24 for the China clay event. Home fleet locos Nos. 33110, 37142 and 50042 Triumph were supplemented by main line guest loco No. 57604 Pendennis Castle, courtesy of Great Western Railway. 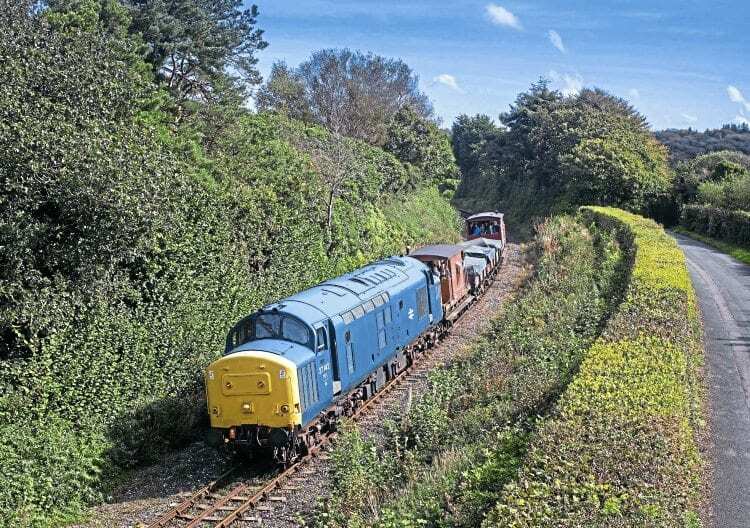 The Class 57/6 is normally seen working the ‘Night Riviera’ between Paddington and Penzance when it passes through Bodmin Parkway station. An intensive timetable provided various options of top-and-tailing and double-heading, and all was going well until the final departure to Bodmin Parkway when a fallen tree was encountered at Fletcher’s Bridge. The train returned quickly to Bodmin General, where a taxi service was organised to convey passengers to Parkway so as not to miss their mainline connections.